As the name suggests, Inn the Park is a contemporary British café and restaurant set in the beautiful and picturesque St James’s Park. Surrounded by beautiful views and a lakeside setting, Inn the Park provides a lovely spot for some British dining in the heart of central London. Inn the Park is circular in shape, and the wrap around wooden-cladding of the exterior allows it to blend effortless with its natural surroundings. There is a rooftop terrace area which follows the swoop of the circular building, offering views of key London landmarks such as Buckingham Palace and the London Eye. Inn the Park opened in 2004 as an initiative between restaurateur Oliver Peyton and Royal Parks. It is a year-round venture and is opened for all day dining (except Sunday evenings), stretching from breakfast to lunch to afternoon teas and dinner. Overseen by Head Chef Tom Catley, Inn the Park serves an ever-changing seasonal British menu. The café/restaurant is divided between a more formal section where diners can order from the a la carte menu, and a more casual dining area where guests can choose from the ‘Grab & Go’ self-service bar that offers a range of sandwiches and ready-to-serve hot food such as burgers and sausage rolls. There is also a freshly churned ice-cream counter serving a variety of ice cream flavours with all the toppings. We had an a la carte lunch at Inn the Park on what turned out to be a beautiful sunny Sunday afternoon. St James’s Park looked stunning, brimming with sunshine and warmth and bursting with the energy of happy people out enjoying the brilliant day. 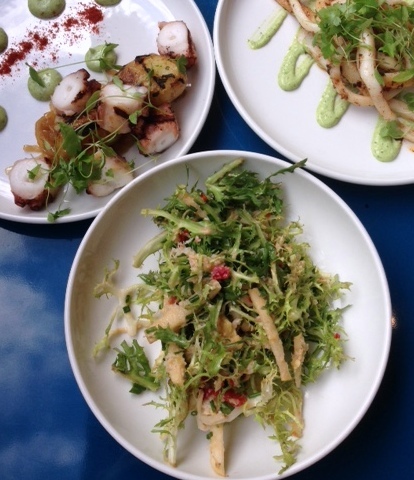 We started with a variety of seafood starters including charred octopus with jersey royals (£8), flamed Newlyn squid with a wild garlic emulsion (£6.50), and handpicked Cornish crab with avocado and nashi pear (£7). The octopus was delightful, being fresh and tender with a slightly charred flavour. 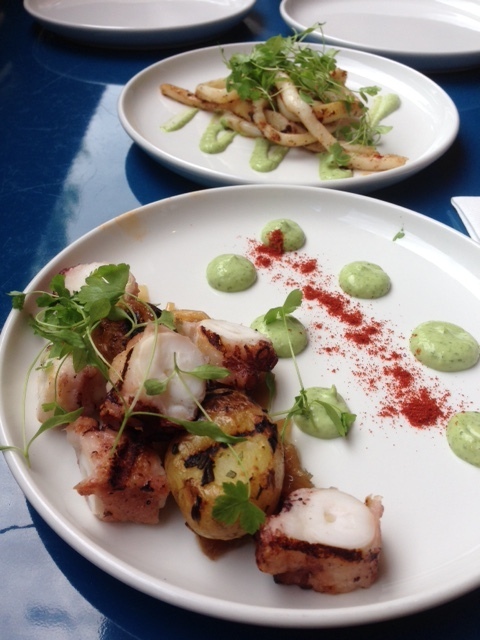 The potatoes were slightly overcooked, but the quality of the octopus spoke for themselves. 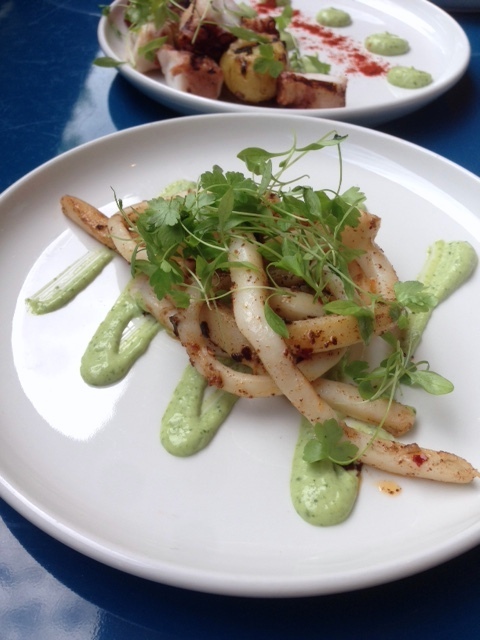 The squid was also lovely and tender and paired well with the pleasant, if somewhat tame tasting garlic emulsion. In contrast, the crab was a disappointing as it was not fresh. We ended up having to leave this dish. 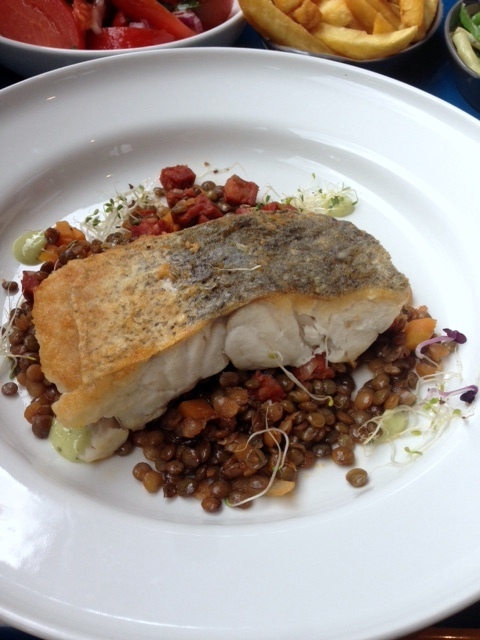 For main we had the roasted hake with braised chorizo and lentils and wild garlic aioli (£17.50). The fish was perfectly cooked and moist, although I would have preferred a crispier skin on the fish. The chorizo and lentil mixture was very tasty but a little more sauce would have worked better. But in the round, this was an enjoyable dish. To desserts, and we chose the Eton mess (£6.50) from the a la carte menu and both the orange and plum cake (£5) and the carrot cake (£5) from the ‘Grab & Go’ self-service bar. 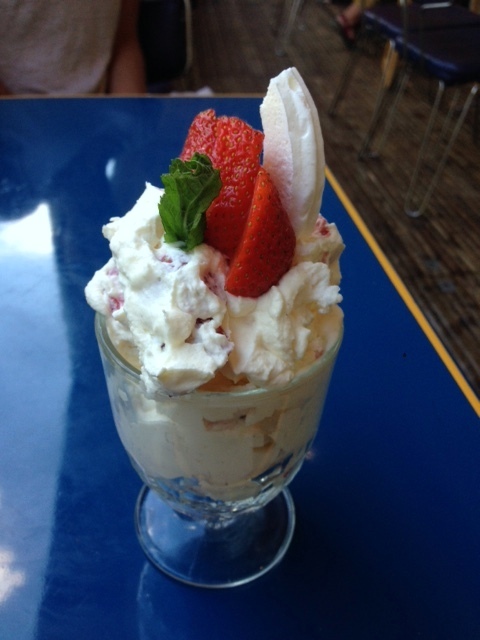 The Eton mess was excellent, with lots of sweet strawberries, delicious cream and soft, fluffy meringue. 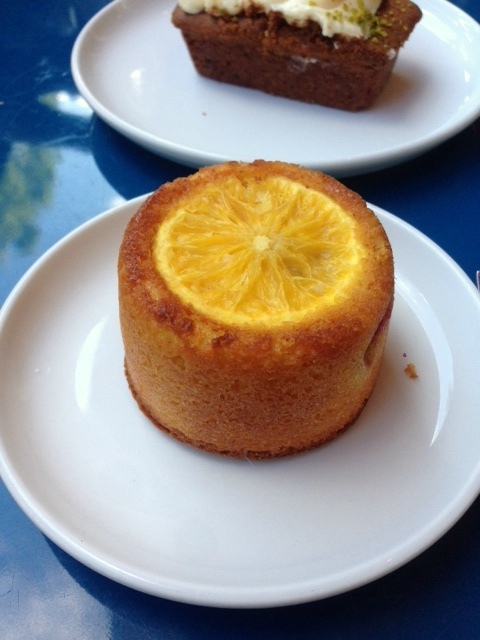 The orange and plum cake was moist and light, but I would have liked it more had it had a stronger orange and plum flavour. The carrot cake wasn’t great. It tasted grainy and was a touch dry. Overall we enjoyed our Sunday lunch experience at Inn the Park, despite the fact that there were a few ‘let downs’. The food wasn’t particularly innovative, nor did it showcase an elevated cooking style. However there were some pleasant flavours and for the most part the produce was fresh. We also had some really lovely, attentive service which went a long way to boost our enjoyment of Inn the Park. And the glorious sunshine was also a joy. But going hand in hand with the sunshine was a huge crowd of people passing through the café/restaurant which turned the toilets into a disaster zone. In this respect, it’s hard to think of Inn the Park as a destination venue, but more of a pleasant place to lunch if you happen to be ‘inn the park’ on a sunny day. 4) The setting – lovely on a nice sunny day. 1) The crab starter – it was not fresh. 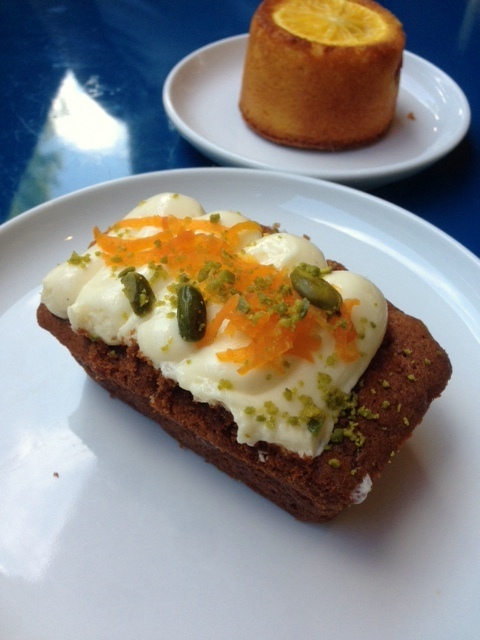 2) The carrot cake from the ‘Grab & Go’ section. Price: £24 to £37 for three courses from the a la carte menu, excludes drinks and service.